The book on Maithil Mahasabha is an interesting commentary on how – at a particular moment in history – thanks to the royal patronage, ‘Orthodoxy’ had taken the front-seat in driving the elitist forces in Mithila to engage themselves with challenges in different walks of life. It also highlights how the fissures and cracks developed in this identity formation. A very well-documented and well-researched analysis, it is a must-read for those interested in reading the history of Mithila as well as Bihar. 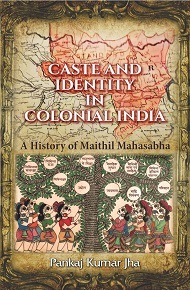 This is a pioneer work that showcases how the Maithil Mahasabha sowed the seeds of fragmentation in Maithil society by considering only Maithil Brahmans and Karna Kayasthas as Maithils – and keeping other castes of Mithila as well as women out of it. The book reflects on the factors which made Maithil Mahasabha, a stumbling block in the creation of a progressive Maithil identity – and eventually getting failed to generate Maithilness even among the sub-sections of Maithil Brahmans. Late nineteenth and early decades of the twentieth century witnessed profound changes having a lasting impact on Indian society. New constellations of caste, language and regional identities came into the surface. History of Maithil Mahasabha unravels one such chapter. The author weaves an intricate account by bringing together court politics, the socio-economic life of the region and the politics of the elites of Mithila. Rich in its use of vernacular historical registers and armed with critical eyes of the discipline, the book is a wonderful account of the language politics and its entanglements with caste and regional moorings. A formidable scholarly intervention which encapsulates the intricate details of discourses and movement channelized through Maithil Mahasabha that finally shaped the contours of Maithil Identity in modern time. Late nineteenth century witnessed origin and proliferation of caste associations, emerging out of colonial policy of exploiting the internal contradictions of Indian society for further segmenting it horizontally so that the colonial power could withstand the ever-germinating disgruntlement of the people of the country. Succeeding to a great extent in sowing the seeds of divisive forces, the policy also in due course accentuated the identity-formation process by utilizing besides other constitutive elements like geographical entity, language and literature, cultural attributes, etc., caste factor as well. The Maithils following the maneuverers of the British Empire, established All India Maithil Mahasabha which along with doing away socio-religious evil practices strived for reestablishing the idiosyncratic personality of Mithila. The present book Caste and Identity: A History of Maithil Mahasabha by presenting the first ever full-length history of the mahasabha will prove beneficial not only to understand the intricacies of caste identity but also the process of identity construction especially in a peripheral society. Pankaj Kumar Jha, UGC Post-Doctoral Research Awardee has to his credit The Colonial Periphery: Imagining Mithila [1875-1950], Nineteenth Century Mithila: Finucane’s Survey of a Village (Co-author) and Mithila; Rich Heritage: Proud Identity (Co-editor) and more than two dozen research papers published in reputed national journals like Gandhi Marg (New Delhi), The Eastern Anthropologist (New Delhi), Social Science Probings (New Delhi), and many more. He teaches History in the Government P.G. College, Chandauli, Uttar Pradesh.